21-Oct-2018 -- On a business trip to Decatur, IL, I decide to visit this confluence, as it has been visited in 2001, over 17 years ago. This confluence was located in fields west of Janvrin Road, which is a gravel road. What i noticed first when I remembered the pictures from the last visit (2001) is that a lot of wind power plants have been setup since in the surrounding. I just parked my car on Janvrin Road and walked to the confluence, which is about 500 meters west of the road. 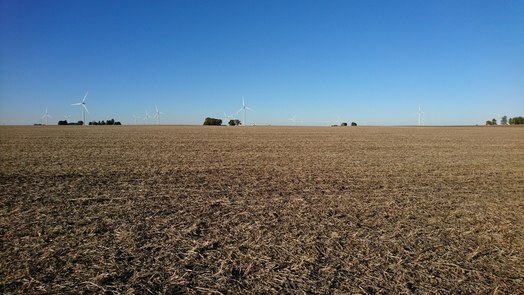 As corn or soy will grow in almost every field in Illinois in spring/summer, it makes sense to visit this confluence after it has been harvested. No special gear but good shoes are needed to walk from the road to the confluence. #1: North view from the confluence. #3: South view from the confluence. #4: West view from the confluence.